Everything you need to know for your holidays in Maleme village of Crete. Information for hotels, apartments, villas for rent and car rental. Trip advices on where to go and what to do in Maleme Crete. Maleme is a village of Chania Crete, it is situated 16 kms from the town of Chania and it is submitted to Municipality of Platanias. Maleme village is well known for its history, the sightseeing, the clean and beautiful beaches and the tourism infrastructure. Its habitants are known for their Cretan hospitality and willingly will assist you if you need their help. At Maleme is also located the “Airport of Maleme” which the most fearsome and important battle in the history of “Battle of Crete” during the Second World War took place on. 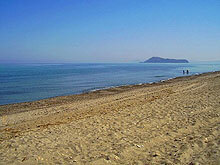 Today, Maleme is a modern touristic village with well organized tourism infrastructure and Travel Services. In Maleme you can also find medical office, pharmacy, hotels and apartments, car rental agencies tavernas, restaurants, gas station, super market, mini market, bakery and souvenir shop.